The reason I'm a zoologist today is down to three people. Firstly, my mum, who was (and still is) an avid naturalist at heart, and who instilled a sense of appreciation for nature from an early age. Secondly, my biology teacher Mrs Val Richards, who saw exactly where my passion lay and encouraged me towards a degree in zoology where others saw different pathways. If you're still out there Mrs Richards, you rock. Last, but not least, is David Attenborough. He didn't have his knighthood when he inspired me, he didn't need one... he was just that awesome. David turned 90 on Sunday 8 May 2016, and I have to say I wish I'm that switched on, alert and full of passion at that age. Frankly, I'd be satisfied with still being alive at that age. I first encountered David Attenborough on 16 January 1979, when I was not quite eight years old, as the first episode of his landmark natural history television program Life on Earth first aired. I remember being transfixed by what I saw, and I had this over-riding sense of wanting to be like David Attenborough, I wanted to go and see the amazing sights of the natural world that he was seeing, and it opened my eyes to the possibilities of life. In October 2006, a little under 27 years later, my wife Erin and I got to work with David for a whole week. I can only imagine what 7 year old me would have thought of this! Don't they say you should never meet your heroes, and he were about to spend a whole week with ours (Erin, of course, viewed David in a similar light). I had been somewhat instrumental in arranging this, because I was being employed by the BBC Natural History Unit as one of their Scientific Advisers for their new series Life in Cold Blood. Specifically, I was the crocodile expert. This extended to suggesting a whole range of different sequences that could be filmed to illustrate just how amazing crocodiles are. I wanted to make sure we blew the audience away with what crocodiles could do, and of course there were a few sequences that I knew we could achieve here in the Northern Territory with saltwater crocodiles. I realised, of course, that this meant we could perhaps get David himself here to do his infamous "pieces to camera" with crocodiles in the same shot. There was one in particular that I knew we could get, because I'd done it myself several months earlier. The only way to do it properly, though, was to get David to do it himself. To cut a long story short, the series producer felt it would make a great sequence, and trusted us to help them get it. No pressure, then. Several months later, in October 2006, we were there at last. Meeting David Attenborough had Erin and I both rather nervous. What if he didn't get on with us? What if we didn't get on with him? Perhaps he was nothing like the person we imagined? David Attenborough, it turns out, is even more remarkable in real life as he is on the screen. He's not a big fan of hero worship, so we had to rein that in, but he's just a normal, humble, down-to-Earth kinda guy who is incredibly smart and possessed of a razor-sharp wit. We fell in love with him immediately, and he got on with Erin in particular like a house on fire. We spent an amazing week filming crocodiles, almost like something out of a dream, with David standing about 15 m in front of dozens of extremely large and extremely hungry wild saltwater crocodiles, capturing a sequence of them cooperatively hunting in a way that hadn't been shown on television before. That sense of relief, when it all worked, and David nailed his pieces to camera without getting eaten... phew! We did several more sequences with him, although not all of them made the cut. Perhaps the best, which I'm still sad didn't make it on screen, involved a freshwater crocodile. This was actually our crocodile, and it was a simple piece to camera where David was talking about how the crocodiles became dominant freshwater predators after the majority of dinosaur groups disappeared, and this little freshwater crocodile got up on his four legs - precisely on cue - and began walking in front of David. 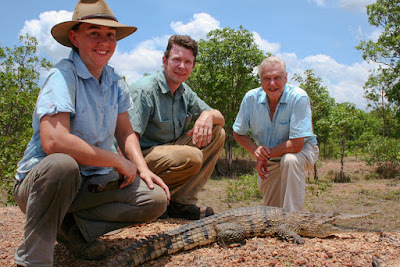 I always imagined the crocodile thinking "Wow, that's David Attenborough! I'd better get this right..." It was awesome, and we have a copy of it somewhere, but it never made the cut for reasons of flow. Such is life in television. When it was time to leave us, David gave Erin an big hug, something she'll never forget. When David gives you a hug, it's genuine, they had such a great time. I was satisfied with a warm handshake. He offered us perhaps the best compliment he could have, that he'd never seen anyone handle crocodiles with as much respect and care as we had. That meant a lot to us. He even wrote us a letter a couple of months later thanking us. We always hoped to work with him again, despite realising just how unlikely this is. At the time of filming Life in Cold Blood he was seriously considering retiring altogether; this was to be his last series. We're glad that he's still chasing his passion. For us, we got to spend a week with this remarkable man who he continues to inspire us to this day. Wow! Just Wow! Amazing story Adam! I'm going to try and search for that segment online. You lucky, lucky, lucky b*&^%#$#d - soooo jealous - but then, they do say never meet your heroes eh? I'm glad your experience put paid to that.